Home Uncategories Applying Tomato Directly On Burnt Skin, Will It Ever Heal? Applying Tomato Directly On Burnt Skin, Will It Ever Heal? There are several natural remedies you can try to soothe your burns. One such effective remedy I recently came across are tomatoes for burnt skin. All you need to do is directly applied a slice of tomato on burnt skin. Hold it on the area for a few minutes and allow it to dry. You’ll be more than surprised to see how it immediately soothes the skin, and any kind of pain associated with instantly fades away. Tomatoes contain lycopene, which is an important nutrient to reduce heat from minor burns. Also, consuming tomatoes on a regular basis can keep you away from sunburns owing to the amount of antioxidants and lycopene they contain. It helps strengthen the skin’s natural protection from UV radiation and inflammation. Tomatoes contain high amounts of vitamin C, which helps brighten the skin and restore its natural glow lost due to harsh chemicals or pollution. You could either apply tomato juice on the face or cut it into two halves and rub it on the skin. It contains astringent properties which make it a great remedy for combination skin. You could make a face pack with mashed avocados and potatoes and apply on skin. Leave it on for 20 to 30 minutes and wash with lukewarm water. 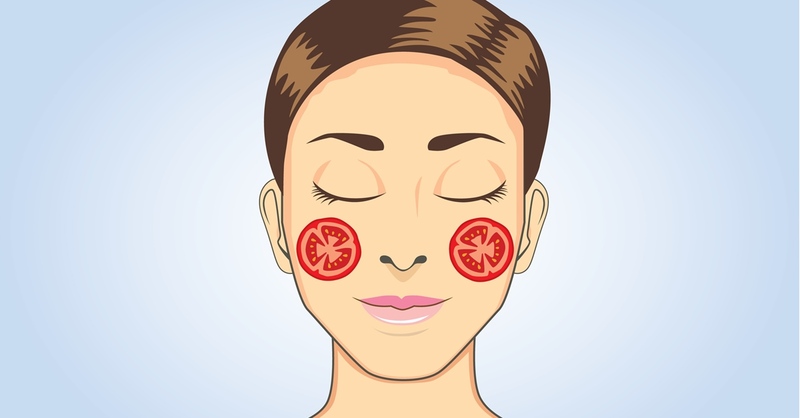 Tomatoes are also excellent as Exfoliators. To use, grind tomatoes with seeds and 1 teaspoon of sugar. Apply and massage gently in circular motion. Lycopene reduces the amount of free radicals in the body. It fights cellular damage, skin reddening, retains moisture and prevents fine lines and wrinkles. It has amazing anti-aging benefits for skin.